7. Slow Trunk Twisting with “Forward”-Leaning – Learn JP MÜLLER'S 15-Minute Full Body Workout "MY SYSTEM"
a. (1stº) Sit on a chair or stool with your legs gripping the legs of the chair. While INHALING, slowly raise the arms sideways to shoulder height with fists closed lightly and arm muscles relaxed, focusing on using shoulder strength alone to raise the arms. During EXHALATION, lower the arms and twist to the left, keeping your hips and seat fixed. Lean slowly forward (over your left hip) without lowering the chin or rounding the back. Next, INHALE while resetting to the initial position (straight back with arms at shoulder height). During the next EXHALATION repeat the movement to the right. Do 10 complete movements over 10 breaths. If you are able to complete the twist the body using your waist and not your knees, you can perform the movement standing up with your feet spread wide apart. As you lean over your hip, the back should be slightly hollowed and eyes looking slightly upward. b. 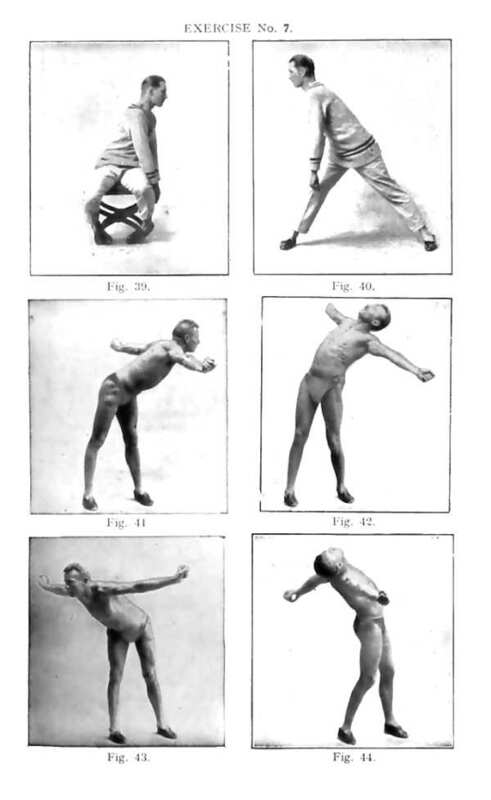 (2ndº) This movement is always done standing, performing the same movements as in 1stº but the arms are consistently held out at shoulder height and the feet are held closer together. 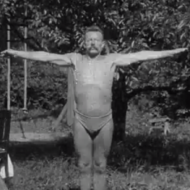 As in the 1stº, begin by INHALING and raising your arms to shoulder height. The movements should be steady an continuous keeping the following breathing pattern in mind: INHALE every time the trunk is raised and during the first half of the twist. EXHALE during the second half of the twist and while leaning over the hip. Do not pause in the forward facing position or the “leaning to the side” position unless your lungs are not completely filled or emptied. c. (3rdº) Begin in the same manner as the 2ndº and continue until you are leaning over your left hip. Instead of returning to the starting position, begin twisting to the right and leaning backwards (while INHALING) so that your chest is now facing upwards. While EXHALING, lean forward so that you are now leaning over your right hip. INHALE, and perform the same movement only to the left. Do not bend the knees more than they need to be. The hips and legs should remain in their forward facing position throughout the movement. The head and arms should not be forced backwards, however the back should be a little bit hollowed. Once again, use the muscles of the waist to move the body steadily. A common mistake is to lean too far downwards so that the proper angle can not be maintained during the twist that follows. Keep the hips fixed to prevent this mistake. Complete ten dual movements in ten breaths. d. (3rdº alternative) Simply reverse the movements in the normal 3rdº. (If the 3rdº and its alternative don’t make sense, check out figures 41-44 here. e. (4thº) This is simply an increase in strength of the 3rdº. Each time, during EXHALATION, when slowly raising the body and leaning over the opposite hip, perform 4-8 jerky side-bends (like in the 4thº of Exercise 4). These side-bends must be done in the waist, not the shoulders.